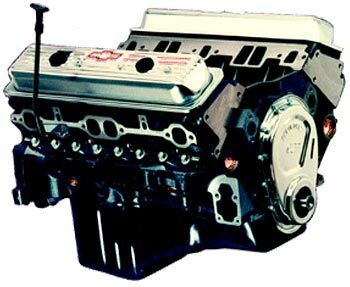 Engines: 330350HOV - 4 Bolt 333 HP / 350 HO Vortec, Base. from California Marine. Description 4 Bolt 333 HP / 350 HO Vortec, Base. Our lowest priced crate engine, the 330 horsepower 350 HO doesn't sacrifice power or durability, it just pumps up the value. With its four bolt main block, nodular iron crankshaft, PM steel connecting rods and light but strong cast aluminum pistons, this engine screams durability. Add to the strong foundation a pair of 64cc Vortec cast iron cylinder heads and a dual pattern camshaft with just a bit of a "lumpy" idle, and you've got the muscle car small block that you've been looking for. Dressed to impress with chrome valve covers and timing cover, this engine will look great between the fenders of your favorite street rod, muscle car or grass roots racer. The cylinder heads on this great little performer use 1.94" intake and 1.50" exhaust valves. The 64cc chambers yield a healthy, but streetable 9.1 to 1 compression ratio. The cam is a modern dual pattern interpretation of the old '65 to '67 Corvette 327 cam. But with more lift and duration on the exhaust side, it does a better job of clearing exhaust from the combustion chamber. We also decreased duration and lift ever so slightly on the intake side to build more cylinder pressure. The result is a cam that makes great torque and horsepower with the 350 HO's 9.1 to 1 compression ratio. Add the new dual plane intake manifold P/N 12496820, 600 cfm carburetor, HEI distributor, torsional damper, water pump and exhaust manifolds or headers and you've got an outstanding muscle motor with a broad, smooth torque curve and an honest 330 horsepower. This manifold has four bolts, not six, to attach it to the cylinder head. Older six-bolt manifolds will not fit the new Vortec heads. Technical Notes: Engine ID code is CC. Requires a counterweighted flywheel or flexplate, 10105832, 14088646, 14088650, 14088765, or 12554824. See flywheel chart. Requires torsional damper 6272221 (6.75") or 12555879 (8"). Oil dipstick located on right side. 650 cfm carburetor recommended. Chrome valve covers and timing cover included. Intake manifold, distributor, flywheel, torsional damper, water pump, and exhaust manifolds are not included. Distributor P/N 1104067 or melonized distributor gear P/N 10456413 must be used on all crate engines with steel camshafts.